Order Clipper Dandelion Tea from the Online Health Food Store UK. 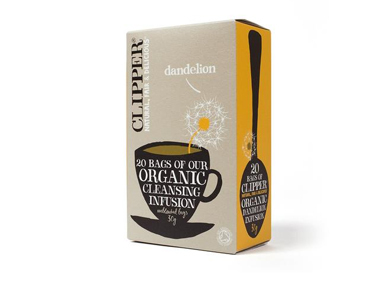 Buy Clipper Organic Dandelion Infusion - 20 bags and other quality Herbal Teas safely online in the UK. Clipper organic dandelion tea bags are naturally caffeine free and perfect as part of a healthy diet. This highly acclaimed herb delivers a refreshing drink, naturally caffeine free and perfect as part of a healthy diet. As official Clipper stockist in the UK, we sell quality Herbal Teas to customers throughout the UK in England, Wales, Scotland and Northern-Ireland. Clipper has a great range of teas and coffees, like: green tea, black tea, decaffeinated tea, fairtrade tea, loose tea, unbleached tea bags, fairtrade coffee, freeze dried coffee. View more products on the Online Health Food Store from Clipper. Where to buy Clipper Dandelion Tea safely online? Shop at the Online Health Food Store if you are wondering where you can buy Clipper Organic Dandelion Infusion - 20 bags safely online in the United Kingdom. Our Health Shop is located in the UK and our award-winning independent has been serving customers in England, Wales, Scotland and Northern-Ireland since 1976. You can buy our teas and coffees and other quality Herbal Teas online and we post out orders to any UK address. Clipper Dandelion Tea - Clipper Organic Dandelion Infusion - 20 bags in Herbal Teas and Tea Loose & Bags.